This tranquil lake front home is the perfect retreat for the traveler looking for modern luxury in a beautiful serene setting. 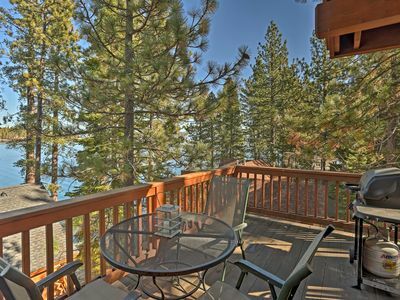 Stunning views across Lake Tahoe to Mt.Tallac are enjoyed the moment you open the front door. The living room and gourmet kitchen, as well as the two master suites upstairs are also open to these amazing lake views. This home was rebuilt in 2012. All appliances, furniture and mattresses are new. The fully equipped cook's kitchen boasts a Miele double oven/microwave, Wolf stove and Zephyr island hood. The dining table seats ten comfortably and there is room for four at the kitchen island. Three of the four bathrooms include beautifully tiled large walk in showers and towel warmers. The main master bath also includes a soaking tub and his and her sinks. Cable and internet are available with a large flat screen TV in the living room and in the second master bedroom as well. A stereo is located in the living room with speakers inside and outside on the deck. A printer and desk are located in in the main master bedroom. 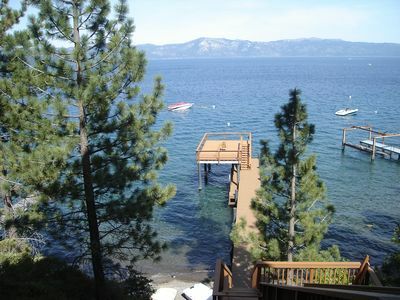 The concrete deck, tiered gardens, and private pier are lovely places for taking in the majestic beauty of Lake Tahoe. The Weber barbaque, ten person outdoor dining table and four person high table make this the perfect place for entertaining. 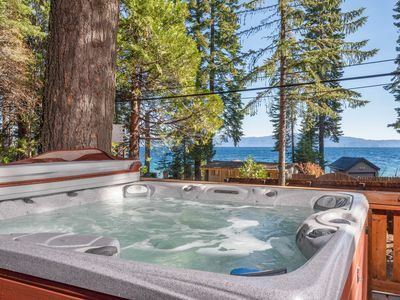 After dinner enjoy the Tahoe sunsets from the six person hot tub, or relax on a chaise lounge. A buoy available for boating enthusiasts. 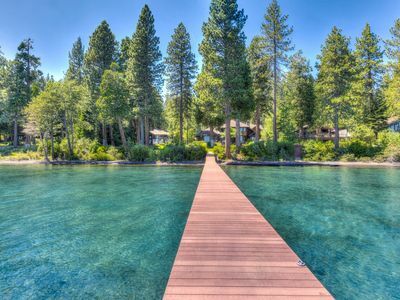 If you do venture from this self contained paradise, shopping and restaurants in Tahoe City are less than ten minutes away. It is approximately twenty minutes to Alpine and Squaw Valley and twenty-five minutes to Northstar At Tahoe. NEW! Waterfront Tahoe City Home w/Stunning Views! Stunning Lakefront Home: Private Pier & More! This absolutely spectacular lakefront home with access to a private pier and panoramic lake views will leave you breathless. 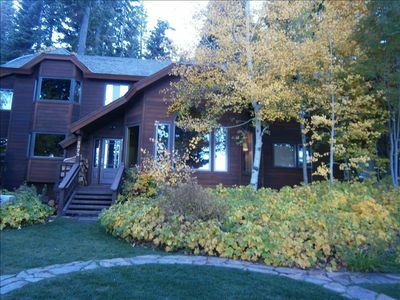 An exclusive property with immaculate landscaping and high end interior touches welcome you to the majesty of Tahoe. The bright and airy main entrance provide you with plenty of space to unload your gear and hang up your coats before you step into the heart of the home. The central space has a soaring vaulted ceiling and connects a warm and inviting living room with the dining room and kitchen. 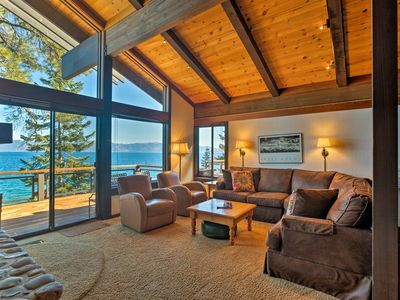 After a long day out on the Lake or on the slopes, sit back and enjoy the wood burning fireplace while taking in the unbeatable views of Lake Tahoe through the floor to ceilings windows. The French doors lead to an impressive and sprawling backyard deck. Ample patio furniture await your company, while an impeccably manicured lawn will lead you under the trees to the lakefront and private pier. The main level contains a master bedroom with ensuite bathroom and direct access to the back deck. Upstairs you will find an additional master bedroom, a guest room, and an open loft with additional sleep and work space. Just a mile from Granlibakken ski and sled hill, and minutes from Homewood and Squaw Valley ski resorts, the outdoor recreation options are limitless. For safety during the winter months, the owner reminds you that you must have a 4 wheel drive vehicle to navigate the angled driveway. There is a maximum of 4 cars allowed at the property. Lakefront, Newly Built Custom Home w/Private Dock! Lakefront Home: Private Beach & Walk to Homewood! 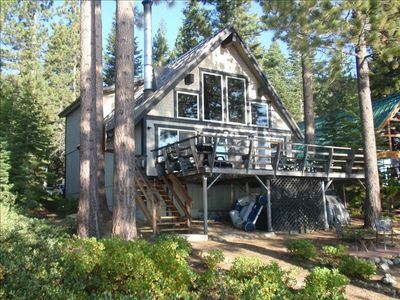 This absolutely charming Tahoe cabin is in a beautiful location, comes with all the comforts of home, provides hassle free parking, and literally has a zero minute commute to the water. With 6 bedrooms and 3.5 bathrooms, this is where 12 friends and family members can comfortably enjoy your next Tahoe vacation. As you enter the front door, you-ll immediately find a dining area with seating for 8, surrounded by large picturesque windows that provide a lot of natural light and provides beautiful outside views. Moving farther in you-ll see a nice living area that has an extremely comfortable leather sofa and loveseat, a flatscreen TV, and a beautiful rock fireplace. The large, spacious kitchen has everything you-ll need for cooking and baking during your stay, and has updated stainless steel appliances and a gas oven and stove. There are six comfortable bedrooms, all with hardwood floors, a dresser for your clothes, and ceiling fans for those warm summer nights. Three of the bedrooms have queen size beds, one had a king size bed, one has a full size bed, and the other has two full size beds. Enjoy your luxury vacation at this beautiful lakefront estate located in Carnelian Bay. 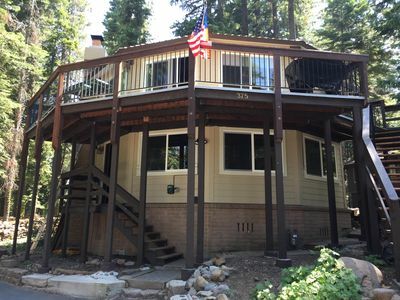 With a 5 bedroom main house featuring two en suite lake view bedrooms, a guest apartment, and game room above the 2 car garage, this home is an excellent basecamp for your Tahoe adventure. Dine on the large deck with sprawling lake views after spending your afternoon lounging on the pier. 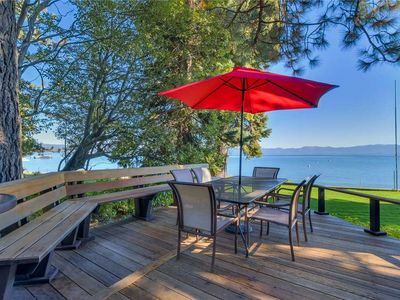 Close to restaurants and numerous outdoor activities, and conveniently located between Tahoe City and Kings Beach, this home comes with an available buoy for guests looking to explore Lake Tahoe with their watercraft. This home was thoughtfully built as a spot for friends and family to get together, and has lots of large, open spaces--both inside and out--to foster gatherings. It has two common areas that are both spacious and cozy; there’s a living room with a large stone fireplace and a family room with a wood-burning stove. Its large kitchen is adjacent to the living room and dining area, so entertaining is easy. The bedrooms are also well-considered--each of them comfortably sleeps two adults, and the master has an ensuite bathroom and a sitting area with TV. Outside, there are many opportunities to enjoy nature; the owners have planted several gardens, and there’s a large wooden bench swing where you can sit back and take in the fresh air. It’s well set up for outdoor meals, too; the deck has a big gas grill, and there’s a unique eating area in an open-air gazebo. 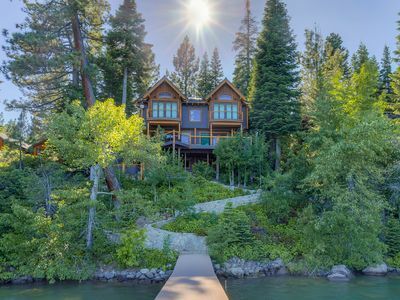 Experience classic Tahoe ambience in this beautiful lakefront home. Situated in one of the West Shore's premier neighborhoods, this house features a private pier, available buoy, and fabulous lake views from all four bedrooms, two of which are en suite. The centrally located kitchen and living area give way to a large deck with outdoor living space, just feet from the shores of Lake Tahoe. With a private pier and available buoy, and close proximity to numerous outdoor activities, this home is the ideal basecamp for a lakefront retreat. The Mariner is a masterfully-designed 4-bedroom North Lake Tahoe cabin that immerses guests in the unparalleled beauty of the area. 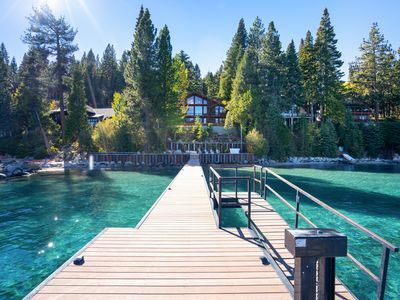 Along with the home, guests receive complimentary access to a private boat dock that extends out into the crystalline water of Lake Tahoe, and a buoy for mooring your own boat. 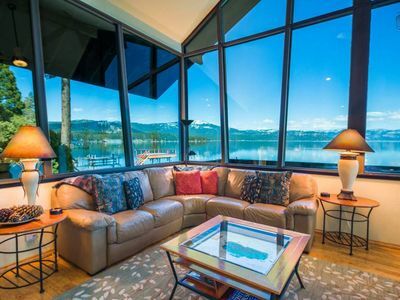 Inside, a two-story wall of windows looks directly onto the tranquil waters of the quiet Carnelian Bay, with the snow-capped peaks rugged and clear in the distance. The modern interior and traditional lodge-inspired exterior are the ideal combination for a refined stay in North Lake Tahoe. The living area is the heart and soul of this beautiful home. The unique architecture provides stunning 270-degree views of unobstructed scenery, making you feel as if the lake is entirely yours. Elegant leather couches and chairs fill the open space, with a lofted ceiling above. A large TV on one wall and a full audio system will round out the ultimate entertainment experience. The open floor plan is segmented by a contemporary three-sided gas fireplace. On one side, the fireplace opens up to dining area, where a polished and deep-stained live edge table has seating for eight guests. The second side faces the living room, and the third side warms and illuminates a study complete with a desk, monitor, and bookshelf. All three of these areas share the breathtaking views of North Lake Tahoe. Step outside onto the wraparound deck and you’ll be treated to an even more mesmerizing display off mountain beauty. It’s from here, with the sun on your face and the clouds drifting above, that you’ll discover why Tahoe is such an alluring destination to travelers worldwide. Inside, the kitchen maximizes space with plenty of granite countertops, and comes fully stocked with everything you’ll need to prepare a home-cooked meal, including a coffee maker, dishwasher, oven, electric stovetop, microwave, and knife set. A laundry closet with a stacked washer and dryer is conveniently located on this level. Here on the first floor just off from the kitchen you’ll find the Master Bedroom, which is calm and inviting with a comfortable king-size bed. Upstairs, a lofted, cozy sitting area looks over the living room below. From up here, you’ll have a new vantage point of the crystal clear waters, which you can see directly through to the pebbly lake floor. The queen guest room has a queen-size bed set into a nook in the wall, and an ensuite bathroom with a stand-alone shower. Open the sliding glass door on the far wall of the room and step onto the balcony to take in the Lake Tahoe air Mark Twain famously noted was the same air breathed by angels. The views from this private oasis are simply astounding. A third guest bedroom up here has a full bed, and in the nearby bunk room, a sturdy wood twin bunk and a twin trundle bed can sleep four guests. A stay at The Mariner is a truly unique experience. The architecture, the design, the views, and the location all work together to create a backdrop for an unforgettable Lake Tahoe vacation. There are two security cameras at this home: one at the front door and one facing the buoy. 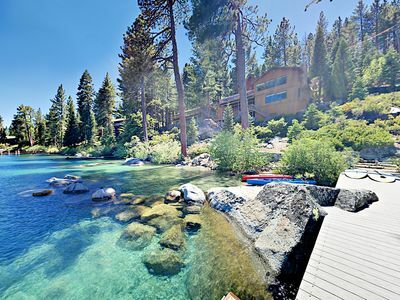 Escape from it all ....Spectacular Property on the West Shore of Lake Tahoe! Enjoy the pristine forests and solitude of the Quiet Walk Estate. The property includes Quaint House. A dream for the whole family. 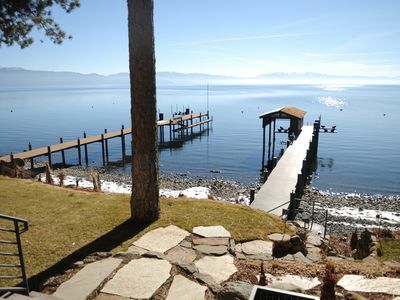 This 1.44 Acre Estate has 2 piers, 2 private buoys, boat hoist & party deck, and roughly 124 feet of Tahoe shoreline. Bordering Sugar Pine Point State Park on the South side, this Estate offers extreme privacy to it's guests. 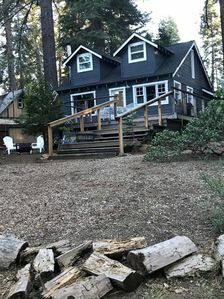 LOCATION: Approximately 9.8 miles from Tahoe City, 3.3 Miles to Homewood and 1.7 miles to Meeks Bay, Quiet Walk Estate convenience and solitude away from the hustle and bustle of the world. Adjoining the northern border of Sugar Pine Point State Park, this estate is truly one of a kind. The West Shore is known for its emerald blue waters, gorgeous forests and easy access to some of Tahoe’s most iconic landmarks. Homewood Marina, Meeks Bay, Sugar Pine Point & DL Bliss State Parks and the legendary Emerald Bay. Sneak away for the ski season and indulge in lakeside luxury at this 3BR/2.5BA home featuring 2,830 square foot across two levels. Perfect as a base for skiing at Heavenly, Sierra, Kirkwood & Squaw Valley ski resorts. Your mountain getaway is available for easy long-term use (30-day minimum stay) and boasts fantastic indoor/outdoor living space with two decks, a Great Room, and master suite offering spectacular views. Set on a private beach in the prestigious gated community of Cascade Properties -- an area known for its exceptionally calm and crystal-clear waters. Drive minutes to Emerald Bay, Fallen Leaf Lake, and Camp Richardson. ABOUT THE HOME The inviting Great Room offers plenty of space to spread out and huge windows frame sweeping water views. 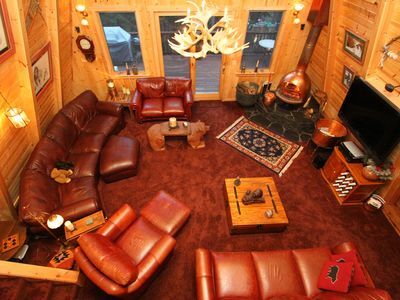 Unwind in the sitting area, furnished with a queen leather sleeper sofa and love seat. A granite wood-burning fireplace sits at the heart of the room. Whip up hearty meals in the well-stocked kitchen, and gather at the dining table with seating for eight before a wall of windows. After dinner, mix a drink at the wet bar set beside a two-seat bistro table. The downstairs family room offers a queen sleeper sofa, love seat, and sofa set before a 60” TV. Step out to the upper-level deck for breathtaking lake views. There’s seating for seven around a dining table and a grill. On the lower level, a separate deck leads to a shared dock. (A nearby buoy is available for guest tie-off; it requires a guest-supplied dinghy or raft for access.) The house offers total sleeping for 14, including two sleeper sofas. The spacious master suite boasts a king bed, a 55” TV, and en-suite with a dual vanity, walk-in shower, and separate tub. The lower-level second bedroom is great for families with a queen bed and a full-over-full bunk bed. A third bedroom offers a queen bed and deck access. The house also has a half bath and a full bathroom with a walk-in shower. AMENITIES & DETAILS Parking is available for three vehicles; one in the driveway, two in the garage. 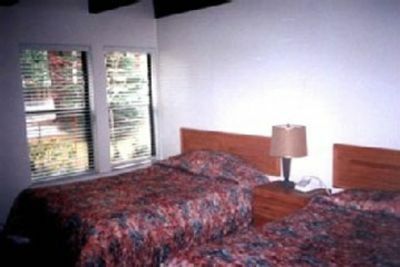 A washer/dryer, complimentary Wi-Fi, and cable TV are provided. 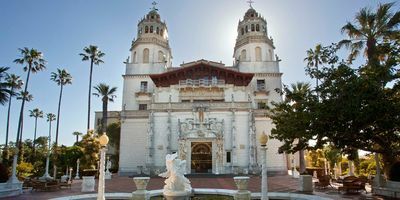 Please note this home is only available for long-term use (30+ day minimum stay) from January - April 2019; subleasing is prohibited. There is construction next door. THE FINE PRINT The strict ordinances that govern Tahoe vacation rentals will also apply to monthly/seasonal rentals like this one. This home cannot be used for parties/weddings/receptions. Maximum allowable occupancy is 14 people and 3 cars, enforced/patrolled 24 hours/day (meaning even an afternoon BBQ with too many people is subject to citation/fine). Over-occupancy, excess vehicles, or excessive noise any time of day will result in a guest fine up to $2,000 (in addition to fines assessed against the homeowner by local authorities). Failure to observe the NO PARTY policy may result in eviction. This home is in a sound-sensitive neighborhood and is not suitable for noisy groups. No smoking is permitted. VHR #1842 LOCATION Although the home is an 18-minute drive to Heavenly, it’s centrally located to provide diversity for your skiing adventures, being only 45 minutes to Squaw Valley and 50 minutes to Kirkwood. Enjoy vacationing in a spectacular winter snowscape right on the lake with roads plowed by the HOA throughout the winter. WHAT TO EXPECT FROM A PROPERTY MANAGED BY TURNKEY VACATION RENTALS TurnKey Vacation Rentals is a leading full-service property management company. We guarantee all listing information is accurate and up to date. From the moment you book, you’ll be provided timely and helpful communications regarding your trip. Access your unit with a keyless secure door code. Your rental will be professionally cleaned and ready for you to enjoy. You can expect all comforts of a fine hotel, including soaps, paper products, and linens. Your home will include a HomeDroid tablet (electronic guest directory) providing specific home details. If you need anything during or after your stay, our 24/7 local team is always ready to help! Surrounded by turquoise waters and shimmering shores, Caesar s Alpine Palace is located in the heart of the most beautiful bay in Lake Tahoe. The house boasts floor to ceiling windows, hardwood floors, and cathedral ceilings that frame the great room upstairs, allowing for stunning views of the lake and the rugged Sierra mountains. Downstairs has a large open floor plan with a family room, dining table, and gourmet kitchen. All bedrooms are well appointed with modern amenities and lake views. 4800 Square Feet, 3 levels, landscaped yard, private pier and a buoy is waiting for you. We have a gas barbeque, large deck with two large patio tables and umbrellas, and another stone patio with lounges perfect for sunbathing and relaxing. This is lakefront living at it s best! 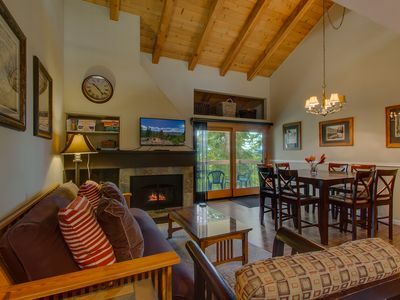 Quail Creek Retreat has everything you are looking for in a Tahoe Vacation Rental home on the West Shore. This two story lake view home not only enjoys a great lake view throughout, but it is also just a short walk to the lake and the private HOA beach. Many recent upgrades to this home make it even more attractive; including brand new furniture, high quality bedding, and large flat-screen televisions in both the great room and downstairs entertainment room. Upstairs, the Great Room is perfectly set up for a large group with plenty of seating, well-equipped kitchen, and opens up to two sunny lake view decks. The first bedroom is also located on the main level and the master bedroom is located down the hall offering a wonderful lake view and a TV/DVD. Downstairs your group will LOVE the entertainment room complete with wet bar. After enjoying the outdoors all day, relax on the leather sectional or play a round of pool. The three remaining bedrooms are located downstairs and the kids will love the bunk rooms, both with enough room to hang out too! • Hot Tub • Lake View • Gas Fireplace in Main Living Room • Walking Distance to Lake • 50'' Flat-screen TV in Main Living Room • Well-traveled Dogs Welcome (Fee applies) • Entertainment Room with Pool Table & Gas Fireplace BED CONFIGURATION: Master BR 1 - King w/ ensuite shower & tub (Upstairs) BR 2 - Queen (Upstairs) BR 3 - Twin over Full Bunk (sleeps 3, Downstairs) BR 4 - King (Downstairs) BR 5 - Two Bunks, (sleeps 4, Downstairs) Living Rm-Sofa Bed Full Bath - shower/tub combo (Downstairs) ABOUT THE AREA: Located halfway between Homewood and Meek's Bay along Lake Tahoe's west shore, you'll find Tahoma, a quiet and quintessential Tahoe town. A true escape from the hectic pace of city life, Tahoma offers access to picturesque beaches, nearby hiking and biking trails, and the oldest lake front bar and restaurant in Tahoe. During the summer month, visit the public beach at Chamber's Landing, less than a 10 minute bike ride, or just a three minute drive from your home. The sandy beach is next to Chambers Landing Bar and Grill, or stop at the Tahoma PDQ market and pick up a picnic lunch on your way to the lake. Venture south to Sugar Pine Point State Park, again less than ten minutes via car or bike, to enjoy sandy beaches, hiking trails, fishing, and a picnic area. During the ski season, you just minutes from Homewood Mountain Resort. Or travel just twenty five to Squaw Valley and Alpine Meadows, two of the premier Tahoe ski areas. A single lift ticket provides access to both resorts, and the Squaw/Alpine Express offers between mountain transportation every 20-30 minutes. ??????? POLICIES & DISCLOSURES 1. Due to the sleeping capacity and popularity of this house, TahoeGetaways strictly enforces our no parties policy. We have a zero tolerance policy when it comes to complaints from neighbors at this property. * All of our homes feature a full kitchen, washer and dryer, outdoor grill, and wireless internet (any exceptions will be noted in above). •	Bedroom 1: King Bed •	Bedroom 2: Queen Bed •	Bedroom 3 (Loft): Two Twin Beds •	Living Room: Queen Futon Sleeper With attention to detail in every room, lovely furnishings, and filtered lake views, this wonderful townhome is sure to please. Located in the Carnelian Woods townhome complex in Carnelian Bay with room to sleep eight, look no further than Silver Pine! The entry level includes two bedrooms. The master bedroom has a king bed, TV with cable, and a glass sliding door to the covered deck where you can enjoy the beautiful views. The second bedroom has a cozy queen-size bed. There is also a full bath with a tub/shower and the laundry closet is across the hall. On the second level, spend quality time together where the living room, dining area, and kitchen are all open to one another. You’ll also find the second full bathroom. Plenty of bath linens are provided. In the living room, relax and warm up by the cozy gas fireplace with slate accents. There’s a comfy chair and a new queen-size futon sleeper, a large flat screen TV with cable and DVD player. Wi-Fi keeps you connected and the adjacent covered deck features a gas barbeque and more glorious views. With all those mouths to feed, it’s handy to stay in for some of your meals. The well-equipped, recently updated kitchen includes granite countertops and backsplash, new appliances and cabinets—everything you need—especially the all-important dishwasher. There are eight chairs at the large dining table and three stools at the breakfast bar. On the loft you’ll find two twin beds and a TV—a perfect space for the kids to call their own. When you’re ready to venture outside, keep everyone entertained in this perfect vacation setting. The Recreation Center / Lodge features a swimming pool, two outdoor hot tubs, locker room saunas, a game room with billiards, a video game arcade, tennis and bocce courts, and a fitness trail. The complex backs up to Tahoe National Forest, offering miles of hiking, biking, cross-country skiing, and other activities year-round. Silver Pine is in Carnelian Bay, where all North Lake Tahoe is right at your doorstep! Stroll down to Magic Carpet mini golf or check out Waterman’s Landing, located at Patton Landing Beach, a 3-acre, pebbly beach known for stand-up paddling. 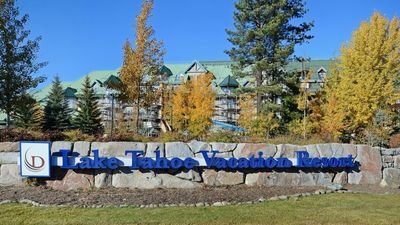 To experience Lake Tahoe gambling and nightlife, Incline Village and Nevada's historic casino Crystal Bay are a short drive away, just across the state line. Closer to home, you'll find superb dining options right in town like Gar Woods Grill and Pier for steaks and fish, the Old Post Office Coffee Shop for hearty breakfasts, and CB's Pizza for hand-tossed pies and beer. You're only 10-12 miles from three great ski resorts—Northstar, Alpine Meadows, and Squaw Valley. Whether you prefer to downhill or cross-country ski, snowboard, snowshoe, or go sledding or ice skating, North Tahoe is the place for winter fun. At Squaw Valley, after conquering the slopes, go tubing with the kids or try out the mini snowmobiles at SnoVentures Activity Zone. There are dogsledding tours too! In every season, the Village at Squaw Valley offers dining, shopping, the Squaw Valley Aerial Tram, and a variety of activities. In the summer, ride the Aerial Tram to High Camp then choose a scenic trail and walk or hike in one of the most breathtaking places in the world! At 8,200 feet elevation, admire the beauty of the Sierra Nevada Mountains with views of Lake Tahoe and Squaw Valley's legendary granite peaks. In the Aerial Tram building lobby, kids and grownups can have a blast climbing the variety of routes on the 30’ simulated Headwall Climbing Wall. If you dare, learn how to do a front or back somersault at Skyjump; all ages are welcome. NOTE: Carnelian Woods hot tubs open daily in summer and winter, Saturdays only in spring and fall. Pool open summer only. Start and end dates will vary based on weather. Charming tudor style home. 3 bedroom 2 1/2 bath. large outside deck with large grass enclosed front yard and fire pit area. Upstairs has pool table and custom bar. downstairs fireplace, and wood burning stove upstairs. Large updated kitchen. 2 large TV's, 1 upstairs and 1 downstairs. Cable and internet included. Just a short walk to one of two private homeowners beach and pier areas. Or if you prefer hiking, exploring nearby Sugar Pine Point State Park or a little further and explore Bliss or Emerald Bay State Parks or Desolation Wilderness. The home is near the west shore bike bath. During winter months Homewood Ski Resort is a mile away with free Homewood Shuttle Service as an option. Buoy is not available to renters * Lake View * Large Deck with outdoor dinning * Large grass front yard * Outdoor fire pit * Approx 2500 sq ft * Internet During summer months therei is a private HOA beach area and HOA pier. Snow lovers will enjoy it's close proximity to Homewood Ski Resort, one mile away. Alpine and Squaw Valley are both within 20 minute drive. BRAND NEW!!! 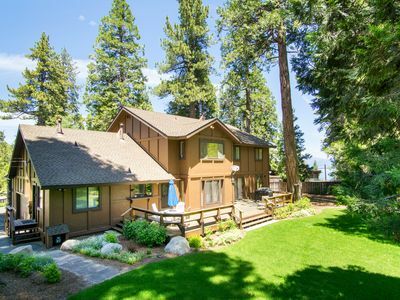 This beautiful Victorian home is conveniently located in downtown Tahoe City. Walk to Commons Beach! Walk to the Lake! Walk to restaurants and stores. New kitchen, bathrooms, flooring, appliances... All NEW!!! You can walk to the lake, shops and restaurants. Easy access to Tahoe City events, marina, Gold Course and Commons Beach and all North Tahoe Ski Areas (Squaw Valley, Alpine Meadows, Homewood, Northstar and Mt Rose). The house is next to three open conservancy lots!! Beautiful nature area. Charming Victorian Style home. Comfy living area with gas fireplace and open space kitchen/dining area with breakfast nook. Next to three open space lots and across the street from cross country area and ice skating rink in winter and baseball field and 9-hole golf course in summer, it makes an open view to the mountains. The lot is flat with enough room to park your RV or boat. The living room is equipped with a big screen TV, a gas fireplace, a double and a single pull out couch and plenty of windows for open views. All three bedrooms and main bathrooms are upstairs; master bedroom has open views of mountains. The third bathroom is located downstairs near laundry room. Brand new washer and dryer. This is an amazing comfy home in the most convenient location!! Just recently back to VRBO after making some home improvements. Our Little Brown Cabin is tucked inside Northshore's quintessential Tahoe Vista steps away from sunny Moon Dune beach, just minutes away from powdery slopes and just waiting for you and yours to create and capture great times and incredible memories. We've owned our Little Brown Cabin since 2000 and have recently opened the doors for others to enjoy the wide-open deck, the easy stroll to town, adjacent hiking trails, beach proximity and overall Lake Tahoe wonders. 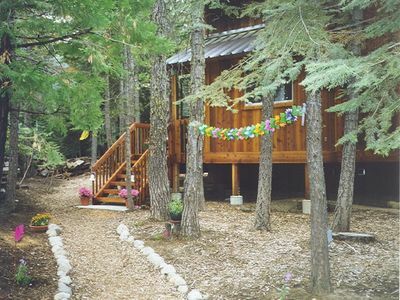 This quaint cabin is perfect for a couple’s getaway or for a memorable family retreat. The cottage interior, design details and period-relevant furnishings enhance the knotty pine walls, stonework and hardwood flooring. Crack open the board games, stroll through the adjacent meadow, wander over to the golf course or cuddle in front of the wood-burning stove while taking in the views of the surrounding forest. Prepare meals in the new, retro and well-equipped kitchen or walk to nearby fine dining. Spend your time lounging on the sunny deck or stroll to nearby Moon dune. For Winter guests Northstar and Diamond Peak resorts are just down the road. Non-skiers who still enjoy the seasonal outdoors can pack in a fun day of sledding at the near snow hill also just down the road. This adorable home away from home will lure you back time and time again for more memorable Tahoe experiences. The downstairs bedroom features an antique double iron bed with cozy patchwork Pottery Barn bedding. The upstairs loft has three twin beds and a TV/DVR for the guest(s) who want to sneak away from the downstairs crowd watching separate programming on the larger television. 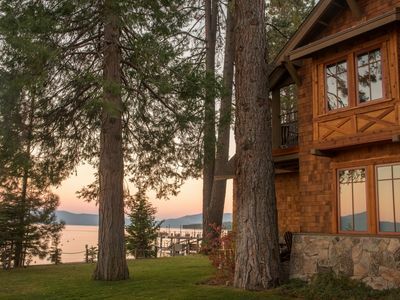 This cabin oozes warmth, privacy, charm and all just two city blocks from Tahoe Vista's treasured Moon Dune beach. Start your memory making with a parsailing adventure, kayak rentals, golf, a scenic hike, nearby skiing or just a good book on a sunny deck or in front of a warm fire. Step back in time and enjoy the way life should be. Let the memory making begin. 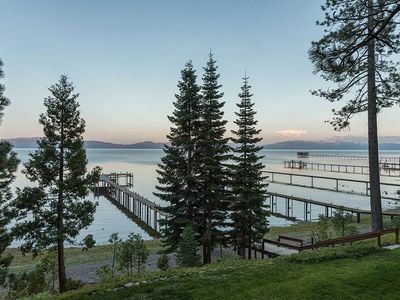 **PETS PROHIBITED** The Saint Francis Lakeside condo complex sits on the North Shore of Lake Tahoe with gorgeous lake views from the private beach and sweeping landscapes of lush green grass throughout the spring, summer and fall. Seasonal HOA amenities include private beach and pier, swimming pool and hot tub, sand volleyball court, horseshoes, stone grill, and tennis courts, making this an ideal vacation rental. Winter access to community indoor hot tub (indoor hot tub is for ADULTS ONLY) and close proximity to ski areas. 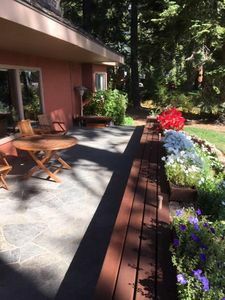 Just 1.5 miles to downtown Tahoe City, easily accessed along a paved bike path. An excellent family-friendly location or getaway for you and your friends! 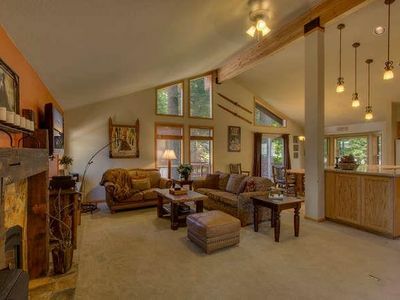 The condo itself is a charming lakeside unit with views of Lake Tahoe and beautiful, cheery Tahoe cabin decor. Entry is on lower level which contains 3 bedrooms: Master with King bed and private 3/4 bathroom (shower only, no tub), one with Queen bed, and another with 2 twins. Shared full bathroom in hall for Queen and Twin bedrooms. Upstairs features lake view balconies off of living area, fully updated kitchen, dining area with seating for 8, another full bathroom and the 4th bedroom with Queen bed. **PLEASE NOTE** Hot Tub/Spa will be closed April 22 to May 24, 2019 Chains or snow tires are required in winter. Please read our Winter Disclosure found by clicking Area Guide/Know Before You Go found at the top of any page. Affectionately known as “Dun Lookin,” this two-story 4BR/2.5BA is across the road from a private pier and beach. This family-friendly retreat with partial lake views spans over 2,000 square feet. Enjoy two living areas, a yard with a playground and a basketball hoop, and a large deck with a grill and a private hot tub. You’ll also find abundant outdoor adventures close at hand with Homewood Resort and Eagle Rock both under a mile away! LIVING AREAS Completely open to each other, two downstairs living areas offer abundant space for the whole family. Concoct a crisp drink at the minibar and get cozy by the wood-burning fireplace in the TV area. 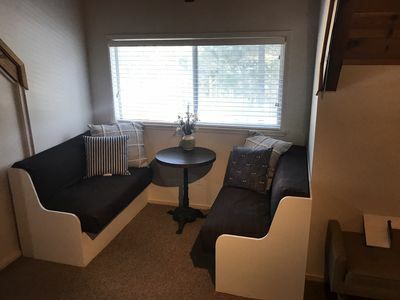 This space is furnished with a sofa, armchair, and 42" TV with cable and a DVD player. The second living space is divided into two areas. On one side, you’ll find a kid-friendly play area, outfitted with a piano, desk, small table, rocking chair, and two bins filled with toys. On the other, large windows flood the space with natural light, while a sofa and an oversized armchair offer comfy seating. KITCHEN & DINING Whip up tasty meals in the well-appointed kitchen, equipped with a full suite of upscale appliances. When you’re ready to eat, enjoy your meals amid the crackling sounds of the wood-burning fireplace, thoughtfully set next to the 10-person dining table. A breakfast nook in the kitchen also seats five. BEDROOMS & BATHS This two-story home sleeps up to 13 guests in the four bedrooms, each appointed with hotel-quality linens. On the first floor, the master bedroom boasts a stately king bed and an en-suite bathroom with a walk-in shower. Also downstairs, the second bedroom provides a twin-over-full bunk bed, while a second bathroom has a tub/shower combination. Upstairs, the third bedroom features a queen bed, two twins, and a spin bike. The fourth bedroom is furnished with a full-size bed and four twins. Between the two, a half bath provides added convenience. Please note that the upstairs bedrooms are accessed via two narrow stairways and have very low ceilings (taller people will need to duck). OUTDOOR AREAS In the large backyard, you’ll find a fire pit, basketball hoop, and a playground with swings and monkey bars. For a family cookout, fire up the Wolf gas grill on the deck and have your meals at the picnic table. EXTRA AMENITIES & MORE DETAILS This dog-friendly home includes speakers and complimentary Wi-Fi throughout the house, as well as a high chair, Pack ‘n Play, games, a washer/dryer, and driveway parking for four cars. Across the street is a private deepwater pier (shared with one neighbor) and the beach. A buoy directly in front of the private pier is available to guests. THE LOCATION Located on the West Shore, your home is close to a playground, tennis courts, biking paths, and hiking trails -- local favorite Eagle Rock is only a mile from your rental! During the winter, Homewood is an easy half-mile away, while the slopes of Squaw and Alpine Meadows are within 13 miles. In the summer, enjoy outdoor dining at nearby restaurants and live music on Sundays at Commons Beach (6 miles). 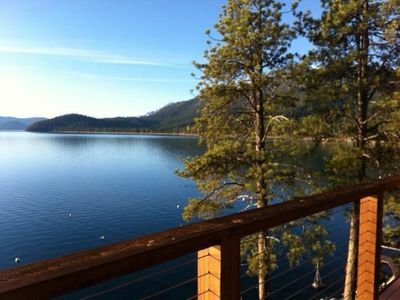 For more dining, shopping, and entertainment, Tahoe City is only 5.6 miles away! WHAT TO EXPECT FROM A PROPERTY MANAGED BY TURNKEY VACATION RENTALS TurnKey Vacation Rentals is a leading full-service property management company. We guarantee all listing information is accurate and up to date. Upon booking, you’ll be provided timely communications regarding your trip. Easily access your vacation home with a keyless secure door code; no need for an in-person key exchange. Your rental will be professionally cleaned and ready for you to enjoy. You can expect all the comforts of a fine hotel, including shampoo, soaps, paper products, and linens. Your home will include a HomeDroid tablet (electronic guest directory) providing specific home details, local suggestions, Wi-Fi access, TV instructions, and more. If you need anything before, during, or after your stay, our 24/7 local team is always ready to help! Recently renovated in 2013, this adorable four bedroom lake view vacation home sleeps eight and features a light and bright open floor plan with lake views, a private hot tub and a pool table! Upstairs, you'll find two spacious bedrooms, one of which enjoys gorgeous views of the lake and direct access to the front deck. Downstairs a shared full bathroom, two more bedrooms, one with a king size bed, the other with two twins, and both rooms are equipped with TVs. Everyone will enjoy the spacious downstairs family room with pool table and large TV. Make dinner with your friends in the well equipped kitchen or venture out to fabulous local dining at Sunnyside or Tahoe City, just a few short miles away. 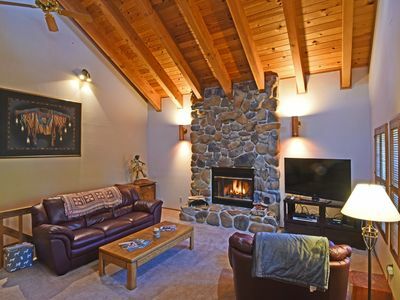 With Lake Tahoe at the end of the driveway and plenty of snowshoeing wilderness to explore, you'll love coming home to a warm, crackling fire and plush, comfortable couches surrounding a big TV. • 2,187 Square Feet • Hot Tub • Lake View • Pool Table • Buoy (guest must provide own dingy) • Well-traveled Dogs Welcome (Fee applies) • Across the street from lake • Wood Fireplace • Public Pier 5 minutes walk from the property • Easy Access to Bike Path • Available for SKI LEASE during the Winter Months! BED CONFIGURATION BR 1 - King (Upstairs) BR 2 - Queen (Upstairs) BR 3 - King (Ground) BR 4 - 2 Twins extra long (Ground) Full Bath - shower only (Ground) Full Bath - shower/tub combo (Upstairs) ABOUT THE AREA Homewood lies four miles south of Sunnyside on Lake Tahoe's west shore. 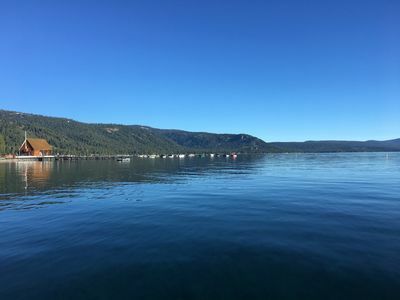 Known for the popular Homewood Mountain Resort, picturesque beaches, miles of hiking and biking trails, and the full service Obexer's Boat Company, Tahoe's first marina, Homewood offers something for everyone. During the summer month, visit the public beach at Chamber's Landing, just a five minute drive from your home. The sandy beach is next to Chambers Landing Bar and Grill, a great spot for lunch or a enjoying a Chambers Punch looking out over the lake. Looking for hike offering breathtaking views, or a place to mountain bike along the lake? Venture just a mile north to Blackwood Canyon. The pebble beach across from the canyon is also a great spot to bring your dog for a swim. During the ski season, you are just minutes from Homewood Mountain Resort, featuring 2,000 skiable acres. From groomed boulevards to their trademark hidden powder stashes, Homewood has it all. With Ellis Peak sheltering the entire mountain from the high-ridge winds, the term "wind hold" is almost unheard of at Homewood. New this winter, Homewood Snowcat Adventures will offer access to backcountry terrain on the flanks of Ellis Peak, above the resort's traditional ski area boundary. Once transported to the summit, groups of up to 10 skiers and riders will enjoy guided access to a wide variety of terrain options – from perfectly-spaced tree runs to steeps, powder bowls and intermediate-level glades – all leading guests back to the in-bounds terrain at the resort. POLICIES & DISCLOSURES: 1. Notice to Boaters: Unfortunately TahoeGetaways is unable to provide watercraft of any kind to our guests. Boaters are advised to provide their own dingy for buoy shuttling. TRPA requires boat inspection/certification and a clean boating certification sticker must be procured. 2. This driveway should be considered steep. 4WD highly advised during the winter season ??????? * All of our homes feature a full kitchen, washer and dryer, outdoor grill, and wireless internet (any exceptions will be noted in above). All the comforts of home with stunning views of Tahoe from every room!. 4 bedrooms 3 full baths. 2 king beds, 1 queen and 2 twins. Great room concept with large fully stocked kitchen. Small family room. 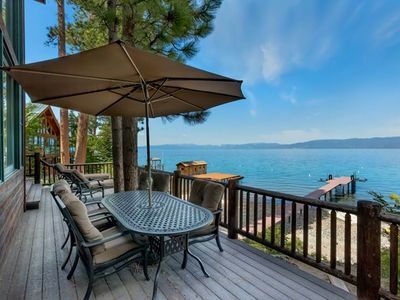 Wrap around deck with beautiful views of Tahoe. Homeowner beach. Close to Homewood ski area. Laundry and small den too. Accommodates 8, and possibly One extremely WELL behaved dog. Please be honest as I love dogs and would like to always welcome them. Enjoy!! West Shore Tahoe, Hot Tub, Steam Shwr, Pool Table. Lakefront + Boat Rides avail. The Property: NOW AVAILABLE FOR SKI LEASE! 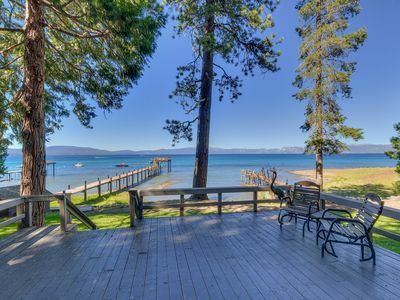 This is a 4,000-sf home on a 10,000-sf lakefront lot, which includes the beach and Lake Tahoe at your toes! The house has 4 levels and panoramic or direct views of Lake Tahoe from almost every room. West Lake Blvd separates the house from the water. There are 4 bedrooms and 3 bathrooms. Amenities include an en-suite sauna in master bedroom, pool table, fully equipped kitchen, BBQ, hot tub, outdoor decks, front and back yards. Additionally, you will have your own boat buoy, access to McKinney Shores private gated beach with shared pier and BBQ areas. Two-car garage plus driveway that fits 2 to 4 cars. 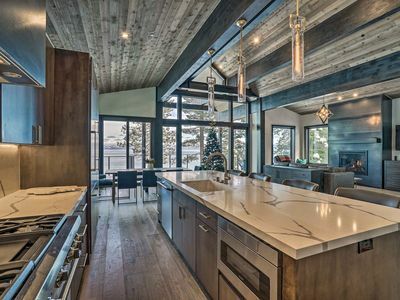 Ski Resorts: The house is a 2-minute drive to Homewood Mountain Resort, 10-minute drive to Granlibakken ski area, 21-minute drive to Squaw Valley and Alpine Meadows ski resorts, 30-minute drive to Northstar Ski Resort, 40-minute drive to Heavenly Mountain Resort, 45-minute drive to Sugarbowl Ski Resort. 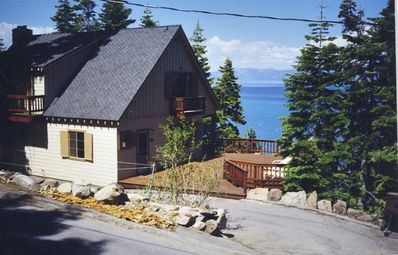 Neighborhood: The house is on the desirable West Shore of Lake Tahoe, between Homewood and Tahoma. The house is part of the McKinney Shores neighborhood, a cluster of luxury mountain homes, close to many Lake Tahoe recreational activities such as boating, hiking, biking (dirt and paved trails), tennis, golf, skiing, shopping, and restaurants. Walk to Chambers Landing Bar and Grill in under 7 minutes. This neighborhood is a quiet residential neighborhood and we do ask guests to be mindful of noise levels. The House - Welcome to our "Meeks Bay Lake House." 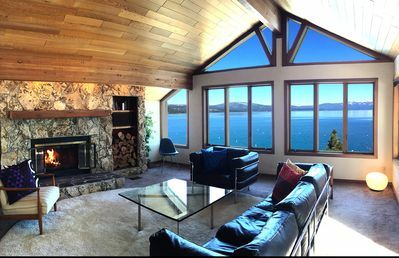 Two large decks and a complete wall of glass give you panoramic vistas day and night of beautiful Lake Tahoe. Location! Location! Location! Only a five minute walk gets you to the pristine and sandy Meeks Bay beach during the summer and a 10 minute drive to the Homewood Mountain Resort for skiing/snowboarding in the winter. This house is thoughtfully and meticulously stocked with everything you and your family need to experience an effortless and memorable vacation. From the carport, walk down 10 steps to one of three entrances to this updated split level home. The main level is designed as a "great room" which allows visibility throughout the dining area, kitchen and living areas. The dining area has a rich mahogany table that can seat 8 people comfortably and is at one end of the great room. Located off the dining area is a full bathroom with a large shower. On the other end is the living area complete with gas fireplace, flat screen TV and the wall of glass that allows you to be outside, even if you're in. the expertly equipped and vacation easy kitchen is centrally located adjacent to a game table, which doubles as another eating area. Step outside to one of the two ample decks, where unobstructed and breathtaking views of Lake Tahoe immediately soothe and rejuvenate. Downstairs are three bedrooms, laundry area and a full bath with double sinks and a tub/shower combination. Each of the bedrooms has a queen size bed, two of which have double French doors that open to the second spacious and private deck. Keep the doors open during the summer to enjoy the gentle breeze off the lake and a view that is "out of this world!" The great room is connected by a spiral staircase to a half bath and loft, which is used for a playroom, sleeping area and/or office. The loft will sleep two people, one on a day bed and the other on an electronic inflatable airbed. A very short drive from Highway 89, the A-frame house sits on a sloped 1/3 of an acre which also has a flat area to one side, used as a barbecue patio and play area. Summer at the “Lake House” - Want to get out of the house and off property? It’s a 5 minute walk to Meeks Bay beach and marina (rental boats, kayaks & paddleboards), a 10 minute ride to Emerald Bay, the Vikingsholm and the trail-head to Eagle Lake, 15 minutes to Kilner Park with tennis courts and climbing structures, 20 minutes to Tahoe City, 30 minutes to Squaw Valley and 40 minutes to Truckee. Bikes are available to rent at Meeks Bay, Homewood, Sunnyside and Tahoe City and there are paved bike trails from Meeks Bay all the way to Squaw Valley. Other exciting adventures include river rafting down the Truckee River and visiting the Tahoe Treetop Adventure Park at Granlibakken for zip-lining. The peace and serenity of our "Meeks Bay Lake House" is matched by the vast array of fun outside activities nearby. 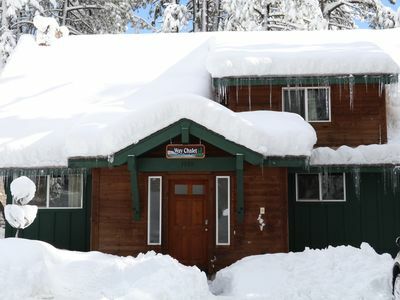 Winter at the “Lake House” - Whether the sun is shining or the snow is falling, Lake Tahoe is beautiful all year round. 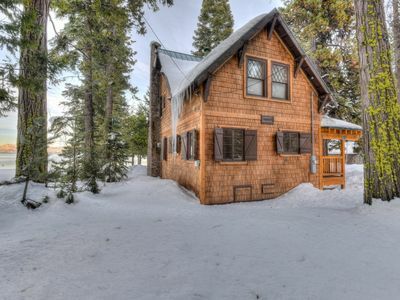 Come to the “Meeks Bay Lake House” for winter sports, but still enjoy the picturesque views that Lake Tahoe offers. Caltrans and El Dorado County plowed roads and daily clearing of the parking deck make access to the house during winter very easy. The Homewood Mountain Resort, a family friendly ski resort, is a mere 10 minute drive away. Drive 30 minutes and you’re at the base of either Alpine Meadows or Squaw Valley. Want even more variety? Northstar is a 45 minute drive and both Sugarbowl and Diamond Peak are less than an hour away. If you’re a cross country skier, ski trails are located at both Sugar Pine Point State Park (12 minute drive) and Tahoe City. Now that’s a lot of skiing! Sledding is available at Homewood, Granlibakken and Squaw Valley. We are open to a ski lease for the “Meeks Bay Lake House” during the 2017-18 ski season. 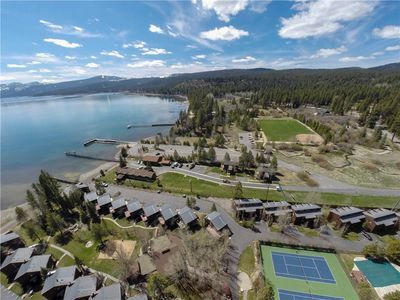 Lakefront - Private Pier and Beach - Sand Volleyball Court - Buoy - HOA If you're looking for a spacious, four bedroom condo right on the water in beautiful Tahoe City - this home is for you! Four spacious bedrooms comfortably sleep eight with two and a half baths for ample room for everyone. The open layout of the living room and kitchen make for easy entertaining with movies and games for the whole family. For those that love the outdoors, there is a large lawn area for lawn games including football, badminton, croquet, and more. The HOA will give you access to a sand volleyball court, private pier and beach. If you plan on bringing your boat, a buoy is available at an additional cost. 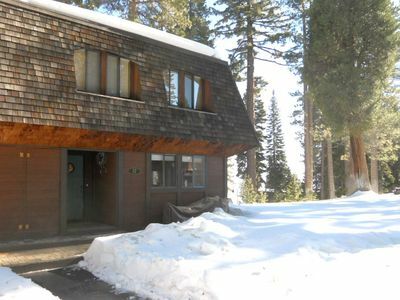 Don't miss out on this beautiful condo in the heart of North Lake Tahoe! Although 80% of our properties are pet-friendly - this is NOT a pet-friendly property. Please be respectful of this. We do not consider service animals pets. If you bring a dog, you will be subject to a fine and are in breach of contract which could result in being asked to leave the property.??????? Additional Fees include cleaning fee, administration fee, and local Transient Occupancy Tax. Check out time is 10 AM. Jillian Schott CA BRE #01800205 Placer County Transient Occupancy Tax # 3009??????? Lakefront home with 4br and 4.5 baths with yard and buoy! **THIS PROPERTY REQUIRES 7 NIGHT STAYS DURING PRIME SUMMER MONTHS** A $1500.00 refundable security deposit paid by check is required on all reservations. 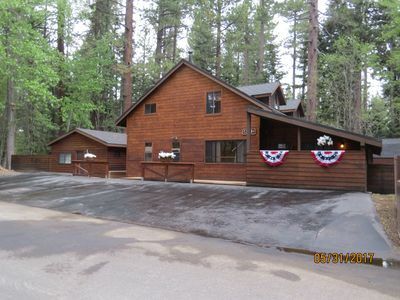 Beautiful lakefront home on the West Shore just south of Tahoe City with 4 bedrooms and 4.5 baths. Dog-friendly with beach, buoy (limited pier access), and large, gorgeous yard. 2 living areas (with 2 fireplaces!) and a spacious, remodeled kitchen on the ground floor, as well as a bedroom with 2 twins. Upper entry level features a master bedroom with lake view, a king bed, balcony and attached full bath; a lake view queen bedroom; and bedroom with 2 twins. Only 1 mile from the stoplight and restaurants in Tahoe City on one side, and 1 mile to Sunnyside Resort on the other. 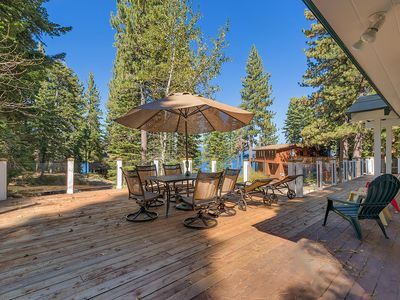 Make Cedar Hollow Lakefront your Lake Tahoe escape! *Please note that the pier is available for loading and unloading only. Chains or snow tires are required in winter. Please read our Winter Disclosure found by clicking Area Guide/Know Before You Go found at the top of any page. The Historic Tahoe Tavern is an ideal spot for your summer or winter vacation. Located ½ mile south of Tahoe City on the shore of Lake Tahoe, nestled in a tranquil forest area with majestic views of the Lake. On the property is a private pier, swimming pool, kid pool, tennis and nearby biking, hiking and skiing. This spacious 4 Bedroom/2 .5 bath two story condominium is a quiet end unit with extra windows, opening onto a large lawn area. The exterior patio connects to a large lawn, has a gas barbeque and lake view which makes it ideal for dining/entertaining. The downstairs includes large kitchen with ample cooking and dining utensils, microwave, coffee maker, toaster and washer/dryer. Kitchen opens to dining area with rustic wooden table with seating for 8-10. The living area is sunken with panoramic vistas of the lake, wood burning fireplace, flat screen TV, WIFI, card table and new carpet thru-out. The upstairs has 4 bedrooms, master with queen/private bath/TV, queen lakefront, bunk twins (sleeps 2) and double bunk twins (sleeps 4), plus separate bath with tub/shower. The resort has an Olympic size pool overlooking the Lake, plus shallow child pool, ping pong table and restrooms. Six newly resurfaced tennis courts with summertime pro for lessons. The private pier is ideal for boating, swimming or just a nice walk with inspiring views of the Lake. During winter months there is a mild sledding hill inside the resort plus Granlibakken across the street. 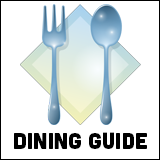 Great selection of restaurants, shopping and nightlife in Tahoe City (.5 mi), Truckee (15 mi) and the Village at Squaw Valley (5 mi) plus the Sunnyside Resort (2 mi). Skiing at world class resorts Squaw Valley and Alpine Meadows is a 15 minute drive with the Homewood resort only 10 minutes. Other nearby ski resorts include Heavenly Valley, Sugar Bowl, Incline, Kirkwood and Northstar. Cross country skiing on groomed trails at nearby Kings Beach or the Royal Gorge/Sugar Bowl resort. Summertime activities include mountain biking, hiking, fishing, golf and water skiing. A number of awesome, premier golf courses are short car rides away and a must for every golfer. Stateline is 20 minutes away with a selection of large gambling casinos and restaurants. We hope you enjoy our cabin as much as our family has over the years! WEST SHORE GEM WITH PANORAMIC VIEWS!!!! Located five miles south of Tahoe City and one mile north of the Homewood Mountain Resort you will find our beautiful Tahoe home . It was built for entertaining during the 1960 Olympics and has a spectacular 180 degree view of the lake . This spacious home is a 3400 sq. ft. single level home with beamed ceilings in the great room and two of the three bedrooms. All bedrooms have extremely comfortable California king size beds . Included are two fold out twin size beds if needed. Two of the bedrooms include televisions, excluding the master. This split lake front home has a panoramic view to take in while you relax on the large front porch as well as the bedrooms, the backyard and the spa. There are amazing views from the comfort of inside of the home. Our great room a has two large TVs and will seat 10 for dinning as well as an extra folding table with two benches accommodating 6 to 8 more people. The great room also includes two Lazy Boy sofas which convert into comfortable queen size air beds. The Homeownwers beach is across the street and has two piers , a beach, picnic tables, and tenders to row out to your boat. Our buoy is in front of the home which allows you to see your boat at all times. The backyard is fenced in and private . You can enjoy the backyard with relaxing sounds of a calming waterfall which flows over boulders and into a small pound. The pond is fenced off for the safety of small children . Our home is comfortable and comes with four Televisions , two gas fireplaces, a free standing stove and a high efficiency forced air heater. The large kitchen is updated with granite counters, two dishwashers, two sinks and two stoves ,both gas and electric. Our garage has an extra side by side refrigerator/freezer and includes a dedicated NEMA 14-50 outlet for your electric vehicle charging needs. There is a large level driveway which accommodates six or more vehicles with room for a boat trailer. Relax and enjoy biking, hiking, swimming, paddle boarding, snowboarding and skiing just minutes from the front door! Gorgeous Condo! Amazing location! A short walk to Heavenly and everything fun! 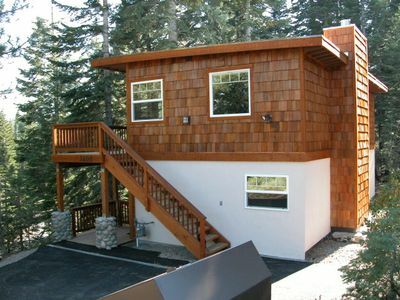 The Way Chalet - Lake Tahoe cabin available for rent: Fantastic location on the West Shore with access to everything. Short drive to Tahoe City and Paige Meadows for hiking, biking, X-Country and Downhill skiing. Walk to the lake without crossing the highway, Firesign Café, and Sunnyside Lodge for meals and drinks. Skiing just minutes away at world-renowned Squaw Valley, Alpine Meadows and Homewood resorts. Great vacation home that features 4 bedrooms (1 King bedroom, 2 Queen bedrooms, and a bunk room with 2 bunkbeds and a trundle - not suitable for more than 2 adults), 3 bathrooms, living/dining room, TV room, deck, new hot tub, grill (not in winter), and outfitted kitchen with 2 ovens and a Keurig (just bring your own groceries and pods). 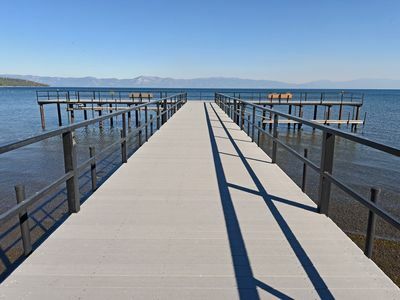 Access to Lake Tahoe Park Homeowner’s beach (laketahoeparkassociation.com) which is lakefront property featuring 2 piers, buoy field, picnic areas, kayak/bike/SUP rentals, rocky beach, playground, bocce ball, basketball and more. Wonderful cabin location does not require crossing of the highway and is fully fenced and pet-friendly (2 dogs max)! 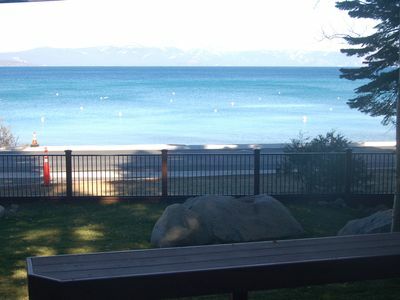 Tahoe Park on the West Shore of Lake Tahoe is a great location. West Shore Sports is right at the park and offers rentals of kayaks, SUPs, bikes and ski equipment. You have access to the lake in the summer, quick drive to 3 different ski resorts in the winter, and walking distance to some great restaurants and the West Shore Market. On the bike path to Tahoe City. Note: there are cameras for security purposes outside the cabin. Please note: limited in the number of adults - 8 adults and no children (additional nightly charge for each additional adult >6), or 6 adults and 4 children. ADDITIONAL CHARGES FOR OVER 6 ADULTS. NO MORE THAN 8 ADULTS (with 0 children. Limit 6 adults if any children). NO SKI LEASES. You will be required to complete a contract sent to you by the owner before your reservation will be considered final. NEW LISTING! Lakefront condo with views, lake access, shared pool, and tennis! Boater's Paradise - Lakefront Home with Hot Tub - Dogs OK! 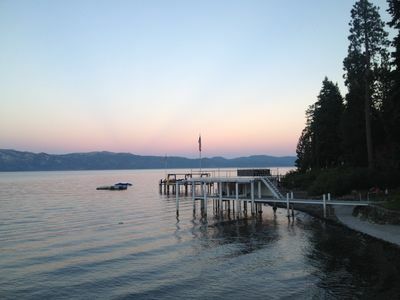 Lake Tahoe sunsets are spectacular, especially when enjoyed from this gorgeous lake front vacation rental home! 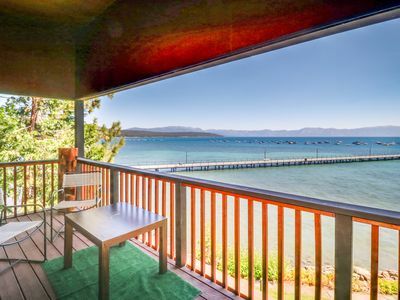 Centrally located in Carnelian Bay, between Tahoe City and Kings Beach, you'll be close to skiing, shopping and dining. The main house enjoys an open concept floor plan with plenty of seating for large groups to gather or spread out. A separate family room, just off of the main room offers up a designated TV area with a flat-screen television and DVD player. Enjoy lake views from wherever you choose whether its making dinner, conversing by the fireplace, or gathered around the dining table for that home cooked meal. You'll be delighted to wake up in the master bedroom which overlooks the lake and includes direct access to the back deck. It also offers a comfortable queen bed, flat-screen TV and spacious en-suite bath complete with soaking tub, an added bonus after a day of recreation on the Lake. The main house also features three additional guest bedrooms as well. • Approx 3000 Square Feet • Private Hot Tub Overlooking Lake Tahoe • Deep Water Buoy • Private Pier • Well-traveled Dogs Welcome (Fee applies) • Real Wood Fireplace • 6 bedrooms, 6 bathrooms in Summer (Boathouse Cottage and Garage Apartment are CLOSED 10/15 - 5/1) BEDROOM & BATHROOM CONFIGURATION DETAILS Main House: Master BR 1 - Queen w/ ensuite separate shower & tub (Downstairs) Junior Master BR 2 - Queen w/ ensuite shower/tub combo (Downstairs) BR 3 - Two Twins (Downstairs) BR 4 - Queen (Downstairs) 2 Hall Baths - shower/tub combo (one Upstairs & one Downstairs) Boat House (Available Memorial Day - October 15th) Full Size Murphy Bed, Kitchenette, and TV Garage Apartment (Available Memorial Day - October 15th) Two Twin Beds & Full Bed ABOUT THE AREA Located between Tahoe City and Kings Beach, this laid back lake side town is known for great paddle boarding, and “Wet Woodys” on the deck at Gar Woods Grill & Pier. Patton Landing is Carnelian Bay's three acre pebbly beach, home to Waterman's Landing, a gourmet coffee house, and a full service café. The property offers a free, nonmotorized "car top" boat launch and stand-up paddleboard and kayak rentals are available so you can enjoy the lake without bringing your own watercraft. The eastern portion of the beach and the deck of the café are dog friendly. In the summer months, this waterfront playground really shines and guests will delight in everything this unique home has to offer. 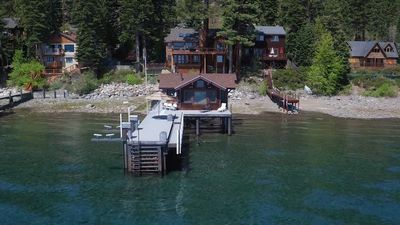 With one of the best piers on Lake Tahoe, this property offers a private deep water pier and a wonderfully charming boat-house that has been converted to a large, self-contained cottage with located on the actual pier! Below the garage, there is yet ANOTHER living space, perfect for kids to occupy, with sleeping capacity for three more, bringing the total sleeping capacity to 14 during the Summer Months. In the winter, you are just 15 minutes from Northstar, where you'll enjoy access to almost 100 trails and over 3,000 skiable acres, impeccable grooming, incredible tree skiing and enough variety to challenge every level of skier. Take advantage of world class terrain parks, cross country skiing, a youth Adventure Park, and a 9000 square foot ice rink surrounded by fire pits and a rink side bar. Squaw Valley, Alpine Meadows, and Homewood are all within a 25 minute drive. POLICIES & DISCLOSURES: 1. Seven Night Minimum Stay Requirement 7/1 – 8/15. 2. Unfortunately Tahoe Getaways is unable to provide watercraft of any kind to our guests. 3. TRPA requires boat inspection/certification and a clean boating certification sticker must be procured. 4. Sorry, boat lift is not available for renter use. 5. Max Occupancy only 8 Guests from November 1 - Memorial Day. Boathouse & Garage Apt closed due to lack of heat and potential pipe freezing. ??????? * All of our homes feature a full kitchen, washer and dryer, outdoor grill, and wireless internet (any exceptions will be noted above). Rustic Glam one bedroom Condo. Nestled on 95 Acres of peaceful, gated property with a mile of lake frontage. Nearly 1000 square feet, this sunny upstairs end unit has dramatic high beamed ceilings and skylights. Constructed of natural building materials of redwood and cedar with a large stone wood burning fireplace and private lakefront deck. Decorated with a California Boho take that includes; antique pine pieces, vintage Navajo and cowhide carpets, leather rockers and library chairs, and a sleigh bed. Fanciful objects of art and crystals bring magic to each room. Amenities include; Remodeled kitchen, two flat screen TV's, stereo sound system, Wifi, washer & dryer, luxury bedding and guest bath. And, the SAUNAS on the grounds are open! Shared Pier and One Buoy - Upon Advanced Request with Buoy Addendum. 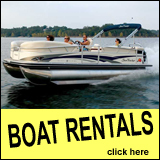 Please contact our Concierge to rent watercraft to access the buoy. Owner does not provide. Open Floor Plan with Vaulted Ceilings, 42" Smart TV, Gas Fireplace, New Carpet and Furnishings, Views! Pets Considered. Please Inquire. Prior Written Approval and $150 Pet Fee Required. 2-Car Garage - Maximum Number of Vehicles Allowed: 4. No Parking on Street Nov. 1st - April 30th for Snow Removal.